We know that the 500 and 400 stades are thus only approximate measures, but approximate for what? It is obvious both are used in “Geographike Hyphegesis” in general terms, but just how adjusted are they? Firstly, if we do not know the correct measurement from which the “approximately 500 stades” is deduced then we do not actually know the correct measurement for the 400 or approximately 400 stades at 36N. It is deduced from nothing that is written in any text. So let us first play with numbers with a sequence which could continue ad nauseam. Firstly we have 500 x 93/115 = 404.378 stades. But if we then use the 5:4 ratio in reverse we have 404.3478 x 1.25 = 505.43475 stades and then proceeding ad nauseam we can then try 505.43475 x 93/115 and arrive at 408.745 stades. Perhaps ridiculous mathematics but also very telling in that the two major units are unknown and have been manipulated to a nice round figure, and probably from a similar calculation made originally with the correct ratio of the parallels. But if for example we accept an approximation for 500 stades as 505.5 stades we have a simple but effective methodology for a first attempt at defining the actual length; One degree latitude at 34/35 north is the Roman 75mpm of 600 x 184.897 metres and is equal to 110.9382Km. Thus each of the 505.5 stades would be 219.46 metres or c742 pedes. First conundrum; was 75mpm taken as 750 pedes and hence the 500 stade becomes 221.8765 metres, a figure similar to that looms large in the mathematics of the stade in the final part. Firstly: “measures are always liable to fluctuation, hence the variable Pes and Pous. If therefore the enquiry had no end in view, but with determining with certainty one absolute value of the standard as a fixed point, it might be truly called playing with numbers”. Secondly; : ““an elementary warning should be written with letters of fire on the mind of every “archaeologist” who makes use of mathematics and statistical techniques or the conclusions drawn with their aid by someone else. M H Moroney puts the point clearly; it is true that it is extremely difficult to interpret figures when they relate to some concrete problem. It is equally true that it is extremely easy to do arithmetic. Herein lies the real difficulty. Averages can be calculated to nineteen places of decimals with astonishing ease. When the job is done it looks very accurate. It is an easy and fatal step to think that the accuracy of our arithmetic is equivalent to the accuracy of our knowledge about the problem in hand. We suffer from delusions of accuracy. Once an enthusiast gets this disease, he and all who depend on his conclusions for their welfare are damned. Examples of how easy it can be to become bemused by the apparent magic powers of numbers are legion and are perhaps symbolised for the innumerate by the sight of an equation in a page of text”.”. Thus instead of what people have written and in many instances misunderstood, surely the actual measurements that could have been achieved are the solution to the problems we face apropos the Marinus/Ptolemy world measurement based upon 500 stades. Only physical measurement will enable a resolution for the Stade length and thus the latitudinal degree. What authors in the centuries some 2000 years ago wrote or thought, without confirmation of any actual survey measure is therefore perhaps absolute rubbish- no physical measurement- no actual research of measurement, just blind acceptance. Thus without a thorough evaluation of what was possible, the “approximation”, the “contrary ratios” and each geographers idea of how far a unit measure “may be manipulated”, we are lost, wasting our time, and thus in all probability never likely to achieve an acceptable guess, an evaluated guess, but one nevertheless, a guess to their intentions. Therefore we must at all times reflect on the fact that 500 and 400 stades are unknown quantities, just somebody’s idea of an excellently simple figure; a manipulation of the facts. We now have excellent measurements for the latitudinal degrees from the Equator to the North Pole and can understand that there is a variation, degree to degree, as we proceed north from the Equator. Thus we must evaluate what was possible against these degree measurements. The difference over 90 degrees in the degree length is therefore 1.128 km and is thus at 45N, the median, only 0.564Km and thus c1/200th change. Not really significant in our calculations as the only places in the world of the Mediterranean Sea that a degree of latitude could accurately be measured is between 24N and 36N on desert type terrains, flat and having a clear 111Km distance to ensure an accurate overall distance measure. That is crucial as will be explained. Now we enter the realm of minute measurement to ascertain that one place is precisely a degree of latitude north or south of the prime marker site. There were two methods, Gnomon Measurement and Star Sights. I am personally dubious about Star Sights to gauge a degree of latitude, as the instruments then were rudimentary and small and the Stars do move, even the so called fixed stars around the North Celestial Pole. That for me is akin to using a hand held Skaphe with a gnomon of 3 inches at most to read a minute change in the shadow length on the inner bowl face. It is hardly accurate enough to produce a meaningful result, but probably told the time accurately enough for the age. Therefore 24N is 100:44.523 and 25N is 100: 46.631, a difference of 2.108 units and eminently measureable. At the northern end of the latitudes we have, 34N = 100:67.451 and at 35N = 100:70, with a difference of 2.57 units, which is again measurable accurately. If we hypothesize on the possible reality, 24/25N is 44.5 to 46.6 and thus 89/200 to 93/200 and then 34/35 is 67.45 to 70 or 27/40 to 28/40, which we can immediately understand and confirm that a single degree could be accurately determined. But to measure it in the landscape requires a relatively flat area some 111Km long! The second is the Roman Degree of 75mpm or 75 x 1.47911Km = 110.93325Km, and that equates to stades, 704.338 x 157.5m, but we are now at 34N where the measurement is 1.8488 x 60 = 110.928Km. Thus nothing is certain, and we must not consider the ancient measures as exact or sacrosanct. The chances are that they are all so manipulated to enable calculations via the abacus to be undertaken that we will be hard pressed to evaluate a truth! However, the Roman stade is not 600 feet but 625 pedes and thus an intriguing point arises. At 36N Marinus/Ptolemy state the ratio is 93/115 and thus 625 x 93/115 = 505.435 and given the propensity in ancient times for the misuse of named measures we can multiply 505.435 x 93/115 and have a measurement of 408.743 stades. Playing with figures, perhaps, but with two approximate measures, 500 and 400 stades to evaluate hopefully correctly, surely we must speculate to produce a number of possibilities, before we jump to judgement. We need not necessarily believe, it may offend our desire for accuracy and determination of the Stade length, but as has been said before, “there is more than one method to solve a problem”. So much for not acknowledging the power of manipulated measurements; I suggest at this stage if you have not looked a brief study of my text ChMEA/1, “Charts, their latitudinal measures re-assessed from historical attempts to define the degree of latitude”, is made now. 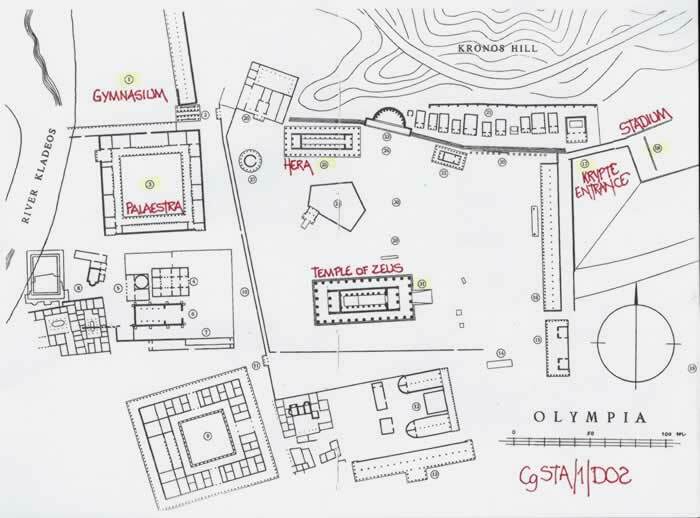 The next investigation ( probably not in the best order) is the ancient stadion or stade which we are informed was determined by the length of the running track at Olympia and was determined by the length of the human foot, that of Herakles. As with the whole Greek/Roman world, constant changes, upgrading, remodelling etc, have left us with little real evidence. The Olympic Stadium now extant is the third on the site, it having been moved to make way for building expansion as the games grew in stature. 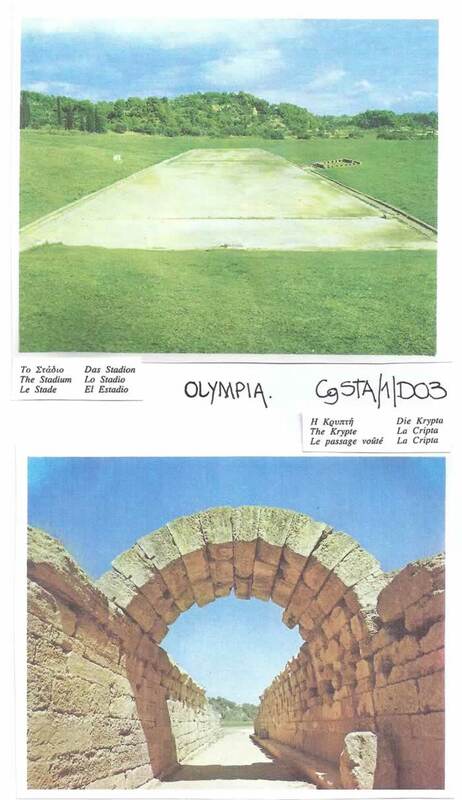 The German Archaeological Institute excavated the extant stadium and found the track length tiles in place with a measurement of 192.25m, and a total length of the overall stadium of 212.5m. Please note the first or Archaic Stadium was moved in the 5th C BCE and this third stadium is dated to the 4th C BCE. Thus 192.25m x 60 = 115.35Km and not a world measure we would recognize today. But as with all measures we just do not know what the world was conceived as in the 5th or 4th C BCE, Greece, at Olympia. The foot would be 192.25 divided by 600 (its Greek) and thus 320.4167mm, making Herakles 1922.5mm, a head and shoulders above the normal 1650mm person. The question which must now be asked; “is this stadion/foot correct for the time”? There are many other buildings at Olympia, the most important being the Temple of Hera and the Temple of Zeus. They were after all the Gods in charge of it all. The Temple of Hera is 50 x 18.75m and can be evaluated as 160 x 60 feet of 312.5mm. The temple of Zeus is 64.12 x 27.66m which equates to 200 x 86.275 feet of 320.6mm or 200 x 86 at 321,63mm and thus tends to confirm the length of the stadion as the Temple is dated to c460BCE. 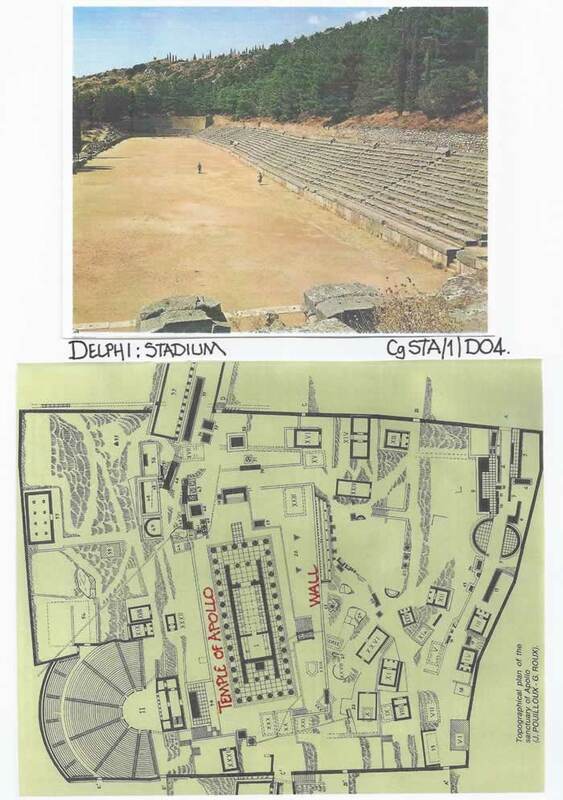 The Pythian or Delphic Games were as important as the Olympic games, but we cannot establish much from the extant stadium as it was remodelled in the 2nd century AD by the Romans and its stade is 177.55m or 600 feet x 295.822mm. I use the Roman Pes of 295.835mm and hence the Romans have used their Pes but the Greek number of 600 per Stade. Evaluating the main Temple, that of Apollo at Delphi, it is 23.82 x 60.32m extant, but as it was destroyed and rebuilt, the latest being in330BCE, caution is required. If we assume it is 200 feet long, the foot is 301.6mm and there would be 79 feet in the width. The Temple of Zeus at Olympia may fairly be described as 200 x 86 and thus I venture to opine the Temple of Apollo followed similar numbers but different measures for the foot. However the temple of Apollo is constructed upon a special wall some 83m long which equates to 275 x 301.6mm. Was the Stadion before the Roman alterations 600 x 301,6mm, and thus 180.96 m. That is only 3.41 metres difference and easily adjusted or just mis-measured by the Romans. However 180.96 x 600 = 108.576Km per degree and is again a measurement unlikely to have been found on the surface of the Earth. 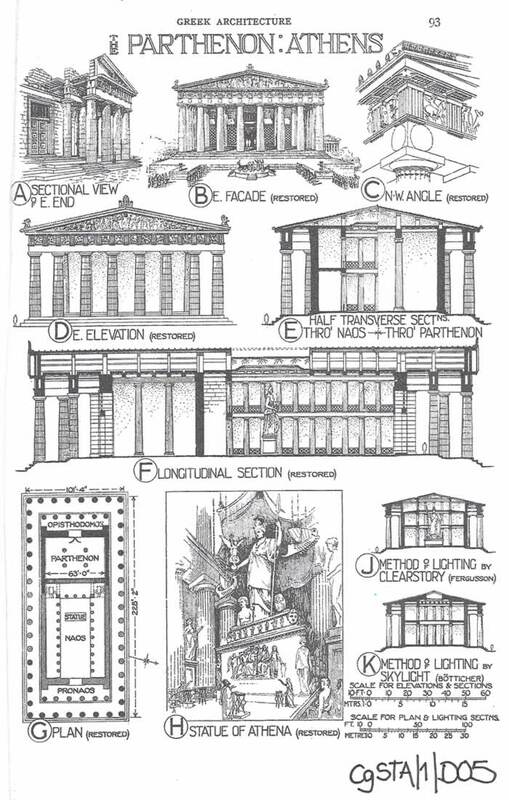 The minimum measure on the Erath is 110.574km and will require a foot of 307.15mm which in our example for Delphi would be 196.386 in the 60.32m length of the Temple and 270.228 in its foundation wall. Not exactly a great change! However please note that at36N the stade requires to be 110.964Km divided by 600 = 184.94m and thus a foot of 308.823mm, which will recur in a surprising place. Thus if a measurement had been made on the face of the Earth the Stade must be greater than 184.29m and the Pes greater than 307.15mm. In all probability, any ancient measurement would have been north of the Tropic of Cancer where the Stade is 184.6m and the foot is 307.667mm and possibly as far north as the 45th latitude where the Stade is 185.23m and the foot is 308.717mm. Just marvel at these figures as we proceed! Thus we arrive at Athens for a final consideration of the Greek/Roman Stade. The Panathenic Stadium track in its final form was 184.96m long and thus we can safely state it was 625 Pedes x 295.936mm. My usage of the Roman system determined the Pes was 295.835mm, the same measurement surely? Nothing is ever easy when we play with measurements, particularly when several attempts are made to measure the same lengths and hence there are a variety of other measures, basically in close agreement, but with enough variation to ensure virtually a complete coverage of the Stade and Foot lengths from the form of the earth figures already given. The basic conflict between the research surveyors of old was the fact that the design of the Parthenon contained “optical corrections to the design” and thus the stylobate had a 2.61 inch rise at the centre and thus any measurement could be taken either over the rise along the step or as a horizontal line from corner to corner. Thus we have; 1) 228 feet x 101 feet 4 inches and; 2) 228 feet 2 inches x 101 feet 4 inches, and then by Penrose, 3) east side 30 889.7; west side 30 896.4; south side 69 541.3; and north side 69 537.3, which give us 308.897, 308.964, 309.072 and 309.055mm for the Attic Foot. But, Balano, 4) gives the width as 30 893 and length 69 565, which equate to 308.93 and 309.178mm per Attic Foot. The original 101.333 feet x 228.167 feet produce, 308.864 and 309.09mm for the Attic Foot. Thus we could assume from the above that the Attic Foot can be assigned a length of 309mm, which will give a stade length of 185.4 metres. This is equivalent to the Earth being measured at 45N where the stade is 185.23 metres, and I have to comment that as close as the figure is to a world measure it is doubtful it was actually survey measured around 45N. It could be from star sights or a shorter half degree or quarter degree multiplied to produce a stade and foot length, but even that is doubtful and open to many errors. However, it is a very plausible stade and thus latitudinal degree measurement. Thus we visit the last and possibly more important situation for determining the stade. Marinus came from the city of Tyre which was originally Phoenician but in his time was solidly a Roman City. When he moved to Alexandria is not known but to have amassed the data he has used in compiling his geographic treatise, he was obviously there for some long time. Thus the work was available to Claudius Ptolemy in the mid 2nd century AD. 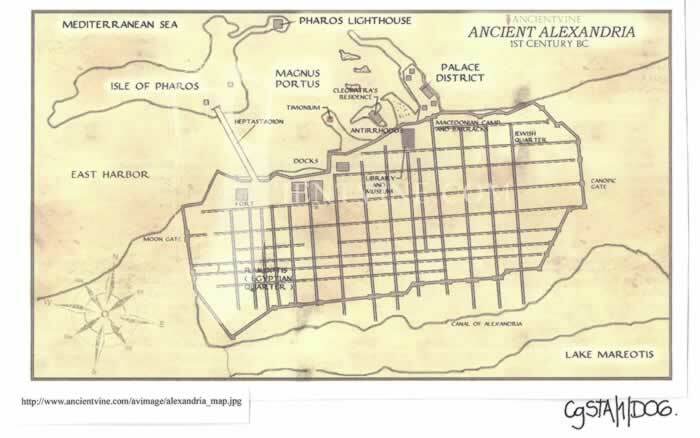 We can surmise the Library at Alexandria held the data which was to be used, as the library was established under the guidance of the Macedonian General Ptolemy and his successors, (the Ptolemaic period is 332-30BCE). Eratosthenes (c285/194BCE) was appointed first Royal tutor by Ptolemy III Eugertes and then succeeded Apollonius Rhodius as head of the Great Library, and produced his text there. Then the measurements available were a mixture of Greek and Egyptian, with no doubt the Egyptian measurements taking precedence as the Ptolemaic Dynasty could not impose upon the Temples etc in this short period from 332BCE. The Roman Period commenced 30BCE (to 395AD) and had little or no impact upon the Ptolemaic systems as the city was well established and basically not altered by the Romans. Thus we may look at the revised Egyptian system which was overlaid by Macedonian Greek ideas such that the “Stade of Alexandria” was developed by them. Simply put it is 600 feet or 400 cubits taken from the Nilometer of Cairo which are 360mm and 540mm respectively. This produces a stade of 216 metres length, and as there does not appear to be an actual Stadium, as in some Greek and most major Roman towns, it would appear to be a wholly mathematical idea. A stade of 216m can be multiplied by 600 to produce a latitudinal degree, which in this case would be 129.6Km and hence overlong for the natural earth. Given that it was established prior to the Roman Period it is tantamount to playing with figures, but if the 216m unit was “manufactured” for Egypt, would it necessarily be for a degree measurement. One thing is certain; the Roman measurement known for centuries in their sphere of influence did not play a part in its production. The Roman latitudinal degree is 75 x 5000 pedes or 750 x 500 pedes, and is 110.938Km. Divide that by 216m and we have 513.6 units. If we chose to use the Eratosthenes area of survey, 24N to 31N, the average is 1846.95m x 60 = 110.817Km which is in fact 513.042 x 216m units. We are already aware from Claudius Ptolemy that both the 500 stade and 400 stade measurements are “approximate units”. We can also surmise that the actual measures were probably awkward to use with the abacus, impractical to explain in simple terms and thus sanitized for public consumption and ease of mathematics. Therefore in a Roman Alexandria c100-150AD, the simplest error was made (one that continued to be made until the 16ht century) that of exchanging the length of measurement because the name was the same. The 513 stades of 216m was exchanged for 500 stades of 185m and thus the world shrank latitudinally by the ratio 216:185 or 7:6. If it had remained 513 stades of 185m then 36N would have been 414.86 x 185m both with a similar excess over the sanitized 500 and 400 units which were approximated. “Furthermore, [he has taken into account] the fact that one degree (of such as the great circle is 3600) contains 500 stades on the surface of the earth- in accordance with the surface measurements that are generally agreed upon– while an arc similar to [one degree of the Equator] on the parallel through Rhodes (that is, the parallel 360 from the equator) contains approximately 400 stades. (We may ignore, in such a rough determination, the slight excess over  that follows from the [exact] ratio of the parallels). What is a slight excess? Would 13 in 500 and 14 in 400 be acceptable? What I find unacceptable is the continuous use of the 500 unit when it is obviously incorrect. Even Berggren and Jones use it without comment to illustrate what the 400 stade may have been originally. Thus I believe all research is null and void until the 500 is evaluated. I CANNOT READ EVERY SINGLE TEXT WRITTEN REGARDING THE WORK OF MARINUS OF TYRE OR CLAUDIUS PTOLEMY. IF SOMEBODY HAS THE ANSWER TO THIS CONUNDRUM PLEASE FORWARD A COPY ASAP. M J Ferrar November 2016. I now include the following text as it impinges upon that you have just studied and illustrates the possible falsifications, sleights of hand and just plainly simple errors of name usage. From Eratosthenes’ via Claudius Ptolemy to Roman, Arab, Medieval and even Columbus, the latitudinal distance measures have been calculated by researchers writing thousands of words but using distance measures which could not have been applicable given the Form of the Earth. Most texts fail the test of reasonable accuracy as there is only one methodology suitable to quantify such measures; that emanating from ground surveys thus the length of the degree is determined from the latitudinal position of the surveyor. 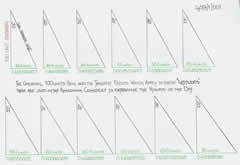 Therefore, with a simple acceptance that the surveyors, be they Greek, Egyptian Cord Stretchers, Agrimensores/geometres, Arab Astronomers or medieval sailors trying to read the Back Staff or similar, were as accurate as possible, and accepting their results, by purely analysing the measurements made, we can determine their basic units and measures. We can even estimate their position when the measure was taken, as the Earth distances vary precisely. This text recalculates, without major comments on previous attempts, the surveys and their measures as they can only have been determined on the face of the earth. Why do this, because the figures used previously are at times incorrect and a standard is required. The earth is spherical but it is not a perfect sphere it is an oblate spheroid. That is the equatorial circle is greater than the putative polar circle by a ratio of 1:297. Not being perfectly spherical the polar circle exists in name only as it is in fact distorted having two radii. Thus it is a non uniform curve as it leaves the equator and approaches the pole. On the face of the earth at the equator, one minute of latitude is 6046.4 feet/ 1842.9 metres, whilst at the pole the equivalent one minute of a degree is 6107.8 feet/1861.7 metres. At the equator the one minute of longitude is 6087.2 feet/1855.4 metres, any of which x 60 will give the appropriate degree length. In my text ChMES/1, which followed ChMIL/1, I concentrated solely on the possible survey measures applicable to Portolan Charts and balanced the differing measures for 24N, 36N and 50N, the nominal latitudinal spread of a Portolan Chart. But by endeavouring to keep that text as short as possible, it became obvious that a large portion of information for the historical measures and usage of the Latitudinal degree was missing. The Longitudinal measurements were equally a subject of little real discussion and certainly were not the subject of survey measures which is therefore another strand of the research to be discussed at some later date. I use only the length of the minute of a degree in either statute measure or metres to calculate the distances on the face of the earth. But normally the metric system will be the final system as other researchers tend to use only that. Illustrative of the difference the distortion of the earth makes is the difference in the radii given; at the equator it is 3963.35 statute miles or 6378.38 kilometres; to the pole it is 3950.01 SM and 6356.92KM. Thus we have the full equatorial circle as 24902.4625SM or 40074.77KM and the polar circle as 24818.645SM or 39939.88KM, and thus the polar compression of 1:297. As an aside, from these figures we can very easily see that Mechain and Delambre, the two French surveyors who set out to establish the degree by measuring from Dunkerque to Barcelona, finally agreed on 40000 KM for the circle, and thus the metre length of today. But, it is perhaps necessary to indicate the problems of calculating degrees on the face of the earth. The most important latitude from times past is 36N, which Claudius Ptolemy stated clearly is a ratio of Latitude to Longitude of 5:4, which is 0.8 in our terms today. But at 36 N the length of one minute of Latitude is 1.8494 Km and thus the degree is 110.964 Km. (Here I will plainly state that in most of my previous texts I have used 111 KM bearing in mind the accuracy of the charts and measures emanating from the last 2000 years.) Therefore the standard methodology for determining the length of the degree of Longitude is to multiply that figure, 110.964 x Cos 36 (0.809017) and the distance is thus 89.7718 Km. But, calculate using the actual length of a longitudinal minute of degree of 1.5028 Km x 60 = 91.248 Km and as such 1.4762 Km longer. But when we read of the length of the Mediterranean Sea being calculated from Cape St Vincent, 9W to Issus, 36E, that is 45 degrees, the difference becomes important as it is 66.429 Km, which is 55.876 Millara and a whole scale bar of 50 Millara different on our charts, which cannot be ignored. However if we use the 5:4 ratio of Ptolemy we have 110.964 x 0.8 = 88.712 Km, which is in itself 1 Km less than the standard method and 2.536 Km less than the actual measurement with the consequential problem for the length of the Mediterranean Sea. Thus we must ask ourselves just how accurate we require being with these measurements? My comment is that if you are not that accurate, then you will not know where discrepancies are occurring and be able to make a considered assessment of the whole chart etc being studied. And, I made that assessment years ago which led me to believing that using 111Km per latitudinal degree was as accurate as any chart required for analysis. Therefore, equipped with the actual Earth surface measurements, I will revisit some calculations which are written about so very often and use partly erroneous measures. As with most research discussing items from the distant past we have only second or third hand details, which we tend to believe or not dependant on the authors credentials. Thus I am ignoring Strabo et al and will concentrate purely on the physical possibility of measures that could have been used, as they can be proven. The basic premise we are given to understand is that Eratosthenes’ measured the latitudinal degree difference between Syene and Alexandria, and then applied the physical distance to calculate the circle of the world. The storyline has been improved over the ages, but the basic measures quoted by all are that the difference in Latitude was 7.2 degrees (1/50th) and the distance was 5000 Stades. Syene; 240 05’N and 320 56’E, and thus we can observe that by adding 240 05’ to 7.2 or rather 70 12’ it equals 310 17’N, hardly a difference we require to worry about in our investigation, and thus we can assume the 7.2 degrees is a valid latitudinal difference. Therefore, if we look at the Form of the Earth, at 24N, one minute is 1846 metres and at 31N one minute is 1847.9 metres, hardly worth worrying about you may think, but remember one degree is 60 times that measure and we are dealing with 7.2 degrees. The average is near 28N, and is 1847 metres. The calculation is thus quite simple to make; 1.847Km x 60 = 110.82Km and thus 7.2 degrees is 797.904Km. There are we are told 5000 Stades between the two towns and thus a single Stade is 159.58 metres by basic division. In fact the Stade used was 157.5 metres and thus 797.904 Km is the equivalent of 5066.057 Stades of 157.5 metres. But did Eratosthenes’ just use the Egyptian Cord Stretchers measurement of the degree and knowing he had 7.2 degrees latitude, simply multiply it out? It appears to be a matter of what do you believe written some 300 years after the fact. Was it just a meridional measurement, and a mis-statement regarding them being on the same meridian when they are 3 degrees, some 286.524Km apart, that is 1819.2 Stadia, and, is it a later writers mis-understanding of the measure. Would the Cord Stretchers of Ancient Egypt not have known the twist of the Nile to the west when leaving Syene, and thus the fact that Alexandria could not be due north of Syene? Are we to believe that Archimedes who wrote to Eratosthenes’ as a person who could solve his riddles, and valued him as a critic? Would Eratosthenes’ therefore be so crass as to not investigate properly? Or are we to actually consider as we see in so many texts copied and recopied, that scribal error could easily have conflated 5066 to 5000 Stades. But actually it is a minor discrepancy after all! There is much written about Roman Surveying, the Agrimensores and Geometres that I merely wish to point out certain facts which often are completely overlooked. Firstly there are two systems in the Roman World; 1) the itinerary measurement using the Roman Mile and, 2) land measurement using the Actus. The first is simple to quantify as the Roman Mile consists of 5000 Pedes of 11.64706 statute inches (295.835mm) or 1000 Passum of 58.2353 inches (1479.177mm) and is thus 1.4791Km or 0.919118 statute miles. Each Roman Mile is 8 Stadia of 625 pedes. The second system is equally simple, but does not interact with the itinerary system. It is based upon the Actus of 120 Pedes to form the land measure of an Acti Quadrati, 120 x 120 pedes. But its origin is mathematical as practically all landscape surveying was carried out by trained Agrimensores/geometres who may not be scribes and have to learn the numbers by rote and thus carry out all calculations mentally. Thus the most basic land measure is derived from the simplest of all squares that of one having full number (maybe) measurements for length and hypotenuse, or so they believed. To set out a perfect square the hypotenuse or diagonal is used to lock the sides into position. Thus a square of 120 x 120 requires a diagonal of perfect measure to set it out. The mathematics are simply; 120 x 120 = 14400, x 2 for a triangle = 28800, the square root of which is 169.7056. But, next door is 170 and that is the square root of 28900. Go to the simplest of mathematics and you have (12 x 12) + (12 x 12) = 288 and 17 x 17 = 289, and what I termed long ago as the spurious ‘1’ appears as it does in so much of the ancient mathematics to solve the apparently unsolvable equations. But let us quantify what has just been written; the difference between 170 and 169.7056 is just 0.2944 pedes or 3.533 uncia, less than a handbreadth in error. But it illustrates the pragmatic approach 2000 years ago; and that when nowadays researchers use a calculator with 10 decimal places and think they are so accurate, they have completely missed the point. I would add here that researchers who quote degrees minutes and seconds for place or town positioning on medieval charts are likewise totally out of order. These Roman surveyors used knotted strings and Decampeda rods (10 pedes) to obtain their lengths. It is worth noting the following from the Land Surveying Handbook; “the method of making direct measurement depends largely on the accuracy required—- under ideal conditions the greatest accuracy that can be expected from a chain or plastic tape is 1:2000, but in practice 1:500 or less will probably be achieved”. Thus 170 pedes = 2040 uncia and between 1:2000 and 1:500 sits 3.5 uncia error. The Roman Degree of Latitude is however a different order of measurement and accuracy. I have already surmised in my text ChMES/1 that the most likely and suitable Roman Province for a measurement of c111Km was “Africa”, basically Tunisia. Thus any ground survey can only have determined the degree of latitude applicable at 34/35N. The Roman latitudinal measure is 75 Roman Miles, 75 x 1.4791Km = 110.9325Km which is the correct measure for 34N where the minute of a degree is 1848.8 metres and thus the degree is 110.928Km. However, it was derived for the Roman Empire and it was a singularly accurate measure which could be used anywhere in the Empire. Did the Roman surveyors actually arrive at the perfect 75 Roman Miles, or did it become adopted as the survey figure was so close, is another matter and one question I think will remain unanswered? The establishment of a latitudinal measurement in the Arab world is accorded to the wishes of Caliph al-Ma’mun, ruler of Baghdad, and is recorded in four texts by noted astronomers of the time. 1) Ahmad ibn’Abdullah (Habash), Persian Astronomer. Surveyors travelled to the desert of Sinjar and located a single degree by measuring the Sun’s altitude to establish a degree length which was measured, and after two measurements it was found to be 56 miles which he states comprise 4000 black cubits. 2) Al Farghani (Alfraganus), Persian Astronomer. He states the value of the degree on the celestial sphere taken on the circumference of the Earth is 56.667 miles, each being 4000 black cubits. 3) Ibn Yunus (c950/1000AD), Egyptian Astronomer. We travelled to the plain near Tadmur (Palmyra, Syria, 340 30’N) and measured the degree as 57 miles. He goes on to note the Habash report as follows; they set off for this purpose in the desert of Sinjar, distance measured as 56.25 miles of 4000 cubits, these being the “Black Cubits” that were adopted by al-Ma’mun. Al Biruni (973-1048AD) Persian Traveller and man of letters. The chosen location is the desert of Sinjar in the area of Mosul, 19 Farsakhs from the city and 43 Farsakhs from Samarra where they are satisfied the ground is level. One degree is 56 miles, but he then quotes Al Farghani and the 56.667 miles but concludes the 56 miles is probably correct. Thus the basic dichotomy of the Arab Degree measuring, 56, 56.25, 56.667 or 57 miles requires answering, but firstly we must reduce the confusion over the Cubit measure, which we can evaluate from the mile distances for a degree. We are quoted two cubit measures, one of 482.5mm and the other of 498mm, which can be evaluated now. The Plain of Sinjar between Samarra (34016’N) and Mosul (36015’N) is as close as required to the latitudes found as the base survey for the Roman Degree from the Form of the Earth. Thus at 35N, 1 minute = 1849.1 metres and a degree is 110.946Km (34N is as above) with the Roman Degree being 110.9325Km. The Arab scholars of this age were well aware of the Roman Mile measurement of 1.4791Km and their degree of 75 Roman Miles. 75 x 5000 pedes = 56 x 4000 cubits and thus the cubit is 1.647 Roman Pedes, which I assume was a basic 1 cubit = 1.667 pedes for ease of translation between measures. 110.946 = 56.667AM = 1.3237RM. The accuracy is unknown but so similar to the Roman Degree Measure as to be considered the same, but an average from the above 3 Roman Mile measures given above for the Arab Mile would be 1.3322RM which is actually 6661 Pedes and thus the cubit of 1/4000th is 1.665 Pedes, that is the 1.667 pedes promulgated above and a completely logical conversion from one measure to the next some 600 years after the Roman Empire collapsed. And, 1 cubit of 1.667 pedes equals 493.157mm which is the median of the two already quoted. I am constantly amazed at researchers stating that the Italian Mile of 1.48Km was used in medieval times. Not only did Italy not exist, the whole country as we now know it being a series of fiefdoms and city states, but the measurement is obviously the Roman Mile and as such should be clearly stated. In Genoa the Roman Mile of 8 stadia was reduced by the proportion used by Claudius Ptolemy in “Geographia”, that is 5/6ths proportion and thus a new measure, the Millara was derived as 1.23258 (1.233) Km, or 6.667 Stadia. That same Millara then underwent another change such that a Marittimo Miglio was established which is 1 ½ times the Millara or 1 ¼ times the Roman Mile and is thus 1.8489Km, or 10 stadia, which is precisely the 1/60th part, the Minute of the Roman Degree of 75 RM or 110.9325Km. My text ChMES/1 has a fuller explanation. Thus the Portolan charts encompass all three measures in their usage of the Millara base. “He claims to have sailed to Guinea in the same ship as Jose Vizinho, the astronomer sent by King Joao II of Portugal to work out the procedures for determining latitude through observation of the sun. On these voyages, Columbus tells us, he would watch the work of the pilots and occasionally attempt to duplicate their observations”. But of course nothing is as simple as that and as has been shown wildly wrong units of the earth’s measures have been quoted. Let us consider the overall facts that are stated by Columbus and assumed by researchers. Firstly, Los Idolos Island, now Iles de Los are at 9.25N and 13.833West, thus we can establish the correct latitudinal measure and compare results. Columbus has stated that Los Idolos Island is 1.0833N and Lisbon was assumed to be 40.25N. (Lisbon is actually 380 42’N and 90 10’W). Therefore, actually we have a latitudinal measure of 9.25 to 38.7N which is a spread of c29.5 degrees latitude. 1 minute of latitude at 39N = 1.8504 Km and thus the average is at 24N and 1.846 Km and a degree of latitude of 110.76Km and thus c29.5 degrees latitude is 3267.42Km. Columbus stated , 1.0833N to 40.25N degrees, or 39.1667 degrees and thus 3267.42 divided by 39.1667 equals 83.423Km, which is the equivalent of 56.4 Roman Miles per degree. So what has Columbus done; 56.4RM is 67.66 Millara or 45.12 Marittimo Miglio, but did he measure the distance as he actually states he noted the distances, probably taken by the ships pilot, but what measurement was the pilot using. Did Jose Vizinho, the King’s astronomer resort to Roman Measures as he was recording the altitude of the sun for latitudinal measure? Thus I offer no more than a simplified explanation of the possible mathematics involved, which may prove the myth of Columbus’s prowess as a navigator and sailor is just that. I suggest interested researchers study the text of Christopher Columbus and the Age of Exploration, An Encyclopaedia; Published first in 1992 with the paperback in 1998. The above text is merely a reference to the necessity for the accuracy of any calculation to be assessed before it is commenced. If you are measuring on a Portolan Chart dating from 1300 to 1600AD, then 111Km is adequate for the latitudinal measure, and that equates to 90 Millara, which can be reduced for longitudinal measures as per my schedule. No further accuracy is required. But if it is your intention to compare actual survey distances then perhaps the Form of the Earth should be studied so that the appropriate lengths can be used for evaluation of the measurers given. There is then the possibility of being very certain of the inter- link between the ancient measures, as, if they purport to be taken at the same latitude, then, they should be equal when translated from one to the other, and be capable of such translation. Finally, at times the calculator is a boon, but when it is so very obvious that the mathematics is ratio based, then those are the figures to be used, not the Sine, Cosine or Tangent decimal. 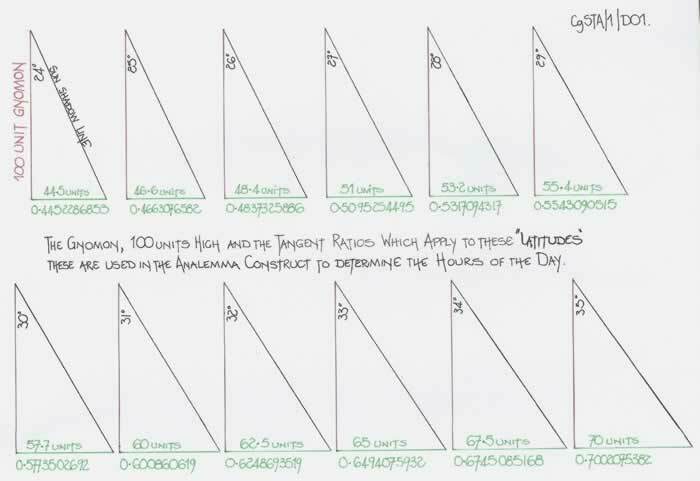 When Vitruvius wrote his 10 Books on Architecture, in Book 9 chapter 7, he quoted the ratio figures for 5 towns when he described the making of the Analemma for preparing the hours of the day model. Alexandria, 5:3 ratio, 30.9637N, but actually 31.2167N (29.9167E) Always 31N !! I would also draw your attention to the “Marteloio Tabulation” of angles which quotes many ratios and these are an explanation of medieval mathematics which should be borne in mind when calculating such angles. My text Four Marteloio discusses and quantifies the problems. Thus hopefully from this short essay a methodology can evolve for determining the distance measures that should be used when evaluating the Latitudes and Longitudes of our Earth. Michael J Ferrar, July 2016 and Michael J Ferrar, November 2016.